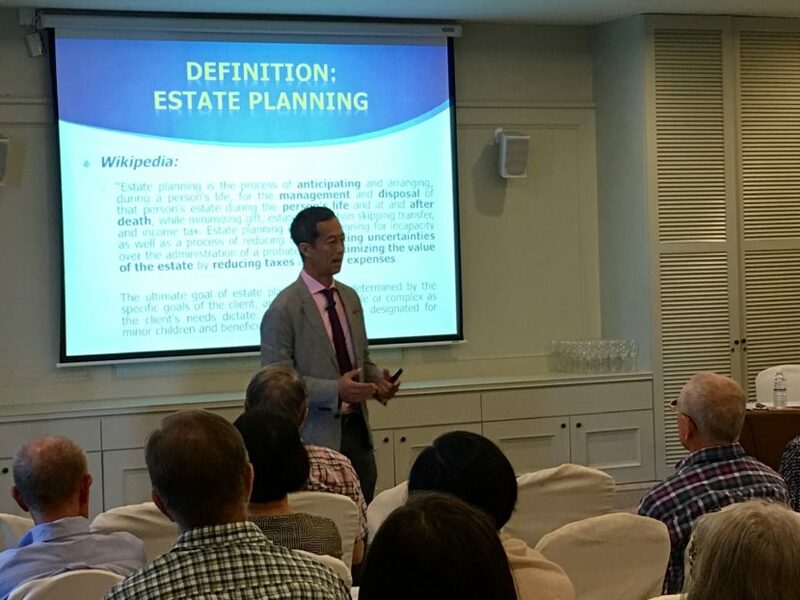 MM2H wills and estate planning issues for expats: Penang has a substantial expat population, a lot of whom are British and are here through the Malaysia My Second Home (“MM2H”) programme. In light of the UK tax changes effective from 6 April 2017, I thought it would be helpful to update the local British expat community as well as Malaysians who are invested in the UK on how the changes may affect them. So I organised a group of talks with a UK tax accountant, Jon Golding. The talks attracted not only British MM2H expats but other nationalities as well as the topics covered the importance of estate planning in general. The topics inspired a lot of questions and sharing on UK tax as well as estate planning and international wills. But it wasn’t just the attendees who benefited. The conversations that stemmed from the Q&A session provided great feedback for us as practitioners to fine-tune our advice to the needs of our clients. My talks around MM2H wills and estate planning issues for expats have inspired some attendees to take action to update their wills. One client followed up with an appointment after attending one of my seminars and asked for her will to be updated by nominating another executor because her executor had become a successful businessman who travelled frequently and hence doesn’t have the time to administer the will. Another client needed to make radical changes to his will after hearing Jon speak about the hefty taxes which could be legally avoided with some changes to his international and Malaysian wills. 2. The importance of choosing the right Executors. Executors are the managers of your will. They declare to the court that they will manage the estate responsibly by determining its assets and liabilities. It is a role that carries with it immense responsibilities. It’s therefore critical to have the right people for the role. However, in cases where there is unlikely to be any disputes, it might be cost efficient and practical to have the main beneficiary double up as the executor (supervised by a proactive law firm) rather than incurring added expenses by appointing professionals who are time poor and may need to charge for their time and costs for managing the estate distribution. 3. The importance of knowing the laws where the assets are as well as the laws of the country the testator is a citizen of. As obvious as this point may be, it is importance to know the laws of the countries in which the assets are located and the laws the client is a citizen of because a conflict of law may arise and limit the implementation of the will. Given these MM2H wills and estate planning issues for expats, we intend to continue to hold educational seminars and talks to inform the expat community. Sam Choong is a lawyer practising in Penang, Malaysia. His areas of practice include estate planning, wills and UK inheritance tax for expats residing or seeking to retire in Malaysia. Which fixed deposit accounts earn the most interest for my Rm300000 bond? Maybank said I will only get 0.1something% which, if it remains for 10years is quite a lot of interest lost! Try United Overseas Bank. I believe they are offering 4% per annum for the first year.